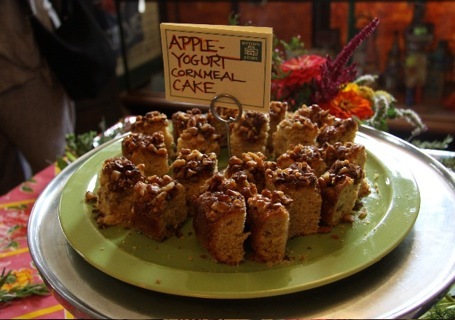 The inaugural DIY Delicious book event was held recently at Jimtown Store in Healdsburg, CA. 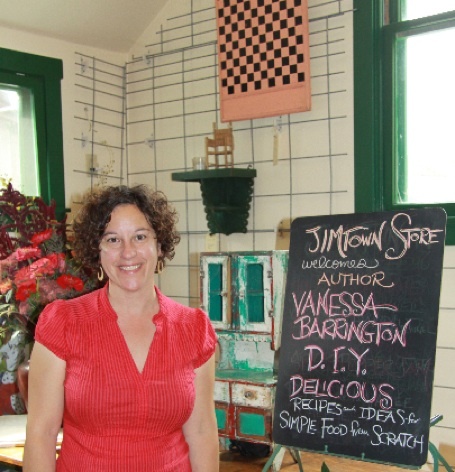 Since working on the recipes for the Jimtown Store cookbook was my first foray into cookbookery, it only seems fitting. Plus it’s a warm, welcoming space that feels like home and Carrie Brown and her staff know how to make a party! But first the food: My dear friend Ellen helped me make fresh cheese, crackers, ajvar dip, and yogurt cakes the day before—all from the book. 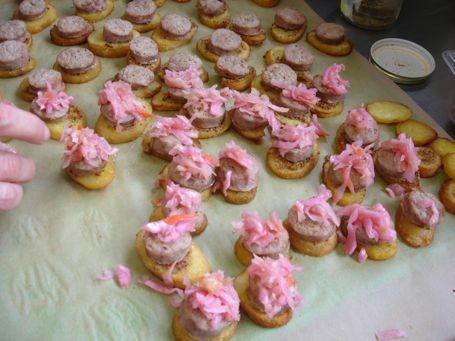 Upon our arrival, all we had to do was crisp the potatoes, assemble the canapés (which included homemade sauerkraut and mustard from the book) and arrange the other items on platters. Carrie and her staff provided the flowers, the space and all the gorgeous herb bundles. It was a fabulous party. Both my sisters showed up, many friends, ex-husband, and even some folks from as far away as Palo Alto. This is a wonderful dip to make this time of year when the eggplants and peppers fill the markets. 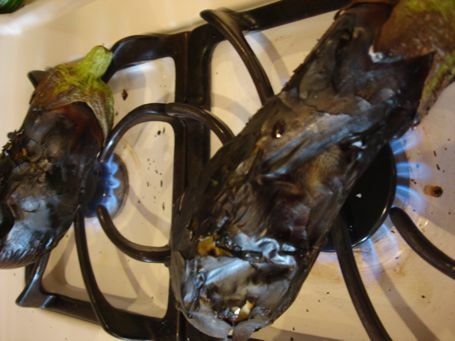 If you take the time to really char the eggplants (don’t worry, the stove will clean up just fine) you will be rewarded with a lovely smokiness that reminds me of a very good baba ghanoush, only better. Look for this recipe on the Chronicle Books Blog later this week. Wash the eggplant and poke it with the tines of a fork in several places. 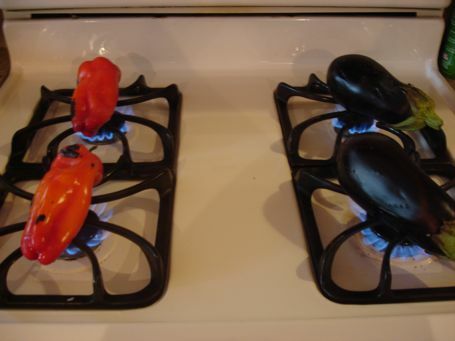 If you have a gas burner, lay it right on top of the grate, turn the burner to high, and roast until blackened all over, turning often with tongs, about 15 minutes. 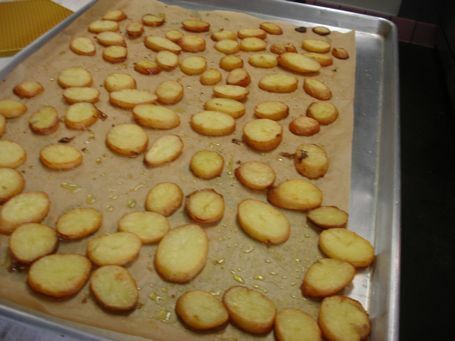 Transfer to a parchment lined baking sheet. Roast the peppers the same way and transfer them to the sheet as well. 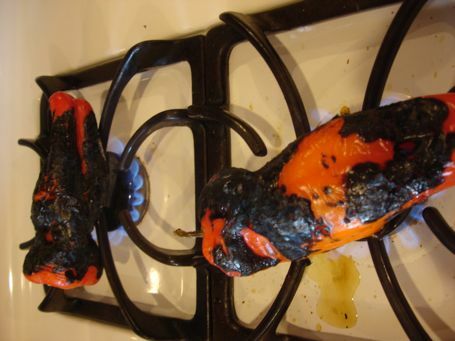 Put the charred peppers and eggplant in the oven and roast until completely soft, about for 10 minutes for the peppers and 20-30 minutes for the eggplant. Remove the peppers to a bowl, and cover with a plate so they can steam. Leave the eggplant in the oven until it is very soft all the way to the center. Test it with a fork to be sure. Once the peppers are cool enough to handle, peel them, and remove the seeds and stems. 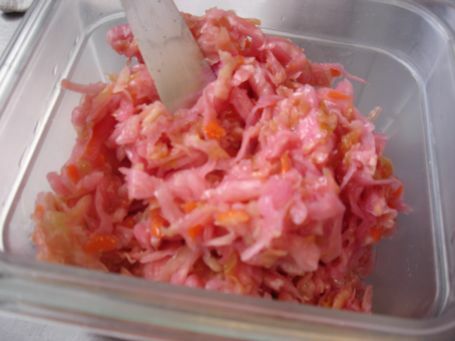 Transfer to a food processor. In a mortar and pestle, pound the garlic with a pinch of salt until you have a smooth paste. Add to the food processor with the peppers and pulse until chunky smooth. When the eggplant is cool enough to handle, scrape the flesh from the skin and remove as many of the seeds as it is easy to do, without worrying too much about removing all of them. Transfer the eggplant to the processor with the peppers and garlic. Add the lemon juice, Aleppo pepper and pulse a few times. Add the olive oil slowly while pulsing. Add salt and freshly ground pepper to taste. Serve immediately or refrigerate, well covered, for up to 10 days. 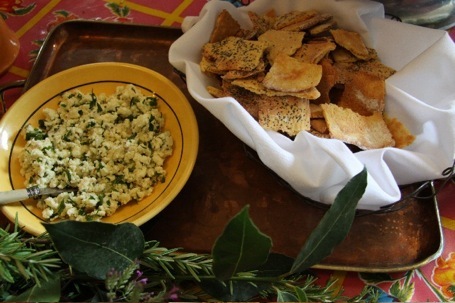 This entry was posted in Books, DIY, book events, community, entertaining, stores and tagged Ajvar, Ajvar Dip Recipe, DIY Delicious Events, Homemade Cheese, Homemade Crackers, Homemade Mustard, Homemade Sauerkraut, Jimtown Store, Yogurt Cake. Bookmark the permalink. Post a comment or leave a trackback: Trackback URL.